Is Blogging on a Celebrity a waste of time? A Guest Post by Haider Afridi from SkFanClub. One of our most dedicated loyal reader and gold star contributor. Presenting his success story. When a new blogger decides to start blogging, the first thing which hits his mind is " Which Topic Should I Blog on?". Than he starts searching for the topics which suites him well. Every topic is successful indeed but it depends on the blogger that how he executes his topic through Blogging. Today i will discuss about Celebrity Blogging. I will share my story with you. With my experience i will try to help you on how to make a successful Celebrity Blog. When i started blogging on a celebrity exact one year back, some Pro-Bloggers advised me to leave celebrity blogging as a celebrity blog does not have much scope. Well i continue blogging. I admit that a Top Class Celebrity Blog can never be compared to a Top Class Tech Blog but it does not means that a Celebrity blog is a complete failure. So after looking at the above mention stats of SkFanClub, do you still believe that Celebrity Blogging is a waste of Time? If you talk about Earnings, i earn a decent amount of Money too. How to Blog on a Celebrity? Well this is something which must cleared to the newbie bloggers. 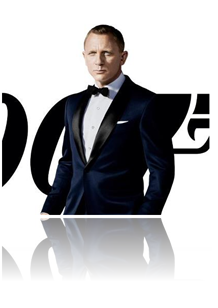 Blogging on a Celebrity means to give the latest News Updates, Wallpapers, Videos, Movie Updates etc. The readers of your blog will be the Fans of the stars you are blogging on. For Example, I blog on Salman Khan so my readers are Salman Khan Fans. How to Get News Updates of a Star? As a n individual, obviously you have no direct source of News Updates of a celebrity but this is the best part of Celebrity Blogging. You do not have to panic on posts in fact posts will come to you. Follow Newspapers and Media Websites. Join Media Fan Pages on Facebook. But the best way to get Celebrity Updates is GOOGLE. Just go to Google and write the name of the celebrity you are blogging on. In my case it is Salman Khan. So this is how i search the news updates of him. 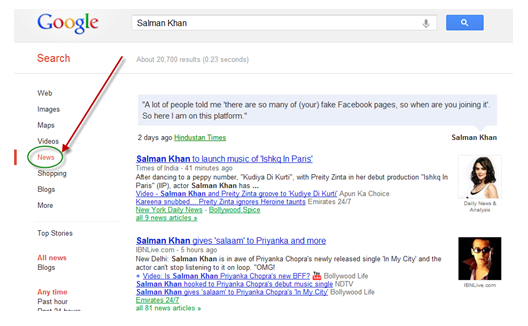 Simply i typed Salman Khan but not on the main page of Google. I searched in the NEWS TAB. You can see in the left side. Here you will get the Updates of the Celebrity from the Official Sources. Search up to 5 Pages for daily updates. It is so simple. Wallpapers and Videos you can get from the Media Fan Pages on Facebook and Twitter. For Example, if you blog on any Indian Celebrity, you must follow the Fan Pages of Business Of Cinema, Apun Ka Choice, Bollywood Hungama etc. Also you must follow the Bollywood Fan Pages too. Although many are not official pages but they can help you a lot. How to post The News Updates? Remember, don't copy paste the news exactly. Read the news updates and post them in your own words. Try to explain in better way for your readers. Sometimes it happens that there is no choice except to Copy Paste the news. Don't worry. It is totally legal but remember to give the full credits to the original news source and always write the copied news or statement in a Blockqoute as Google does not consider it Copied Content otherwise you and your blog have to face penalty from Google. Think for a while. When a reader can get the same news updates from other sources than why he should come to your blog ? This is where you have to work. Create uniqueness in your work. Try to publish the news updates as soon as possible. Try to update only the confirmed updates not the rumors as in Entertainment field, there are many rumors around every day. This is another great part of Celebrity blogging. You can build a Strong Social Network. If 50 people visits a Tech blog, only 1 out of 50 will like the Social Pages of the blog but on the Celebrity blog, at least 10 out of 50 visitors will follow your Social Pages. Do not use your Facebook Page much for Traffic. Means do not share many links on Pages to get traffic. Share Pictures only because Fans Like, Comment and Share the Pictures of the celebrity. Post as much as you can. Try to post a Good Wallpaper of the celebrity after every 1-2 hours. Add the fans of the same celebrity on whom you are blogging in your personal Facebook profile. If you follow these tips, you will indeed have a strong Social Network but Keep Patience ! You will not get thousands of Fans in one night. It will take months and years. Celebrity blog does not means that you only share news updates. This will not give you much traffic from Search Engines so try to add one alternative topic on your blog but choose the topic carefully so the fans should not get irritate. For Example, i share Box Office Updates of latest Bollywood movies along with Salman Khan. It gives me good traffic from Search Engines. But for the alternate topic you must have a good knowledge of it.